TREES that were on land originally timbered were part of the naturalsoil development. In no circumstances is the complete destruction of all this timbernecessary or desirable for farming and grazing pursuits. There is probably no other land development work that has been socompletely unplanned and haphazard as that of timber killing and clearing and nofactor of fertility so completely ignored. In order to grow crops and satisfactory pasture on forested country,clearing of timber is necessary. Gradually more and more timber is cleared becauseof the disadvantageous effect of trees on crop land. However, like cultivation, clearing has been overdone, with the resultthat soil fertility eventually suffered and crop and pasture yields were affected. Grasses and timber do not usually grow well together. A large treewill all too often affect quite a sizeable area of crop or pasture land and the tendencyis to get rid of the tree. On some farming lands trees are left scattered about. These trees,no longer living in forest conditions, tend to die out. It is often observed thatthe upper and outer branches are dead; the trees are slowly dying together. On somefarms they are already dead. Properties which contain some steep country are often cleared to allowall the flatter country to be cropped. The steep land is left timbered and used asgrazing areas. The general practice of leaving all steep country in timber to protectit from erosion has not been successful, nor has this practice improved the timber.Steep country, left fully timbered, is often the greatest bushfire hazard and theworst area for pests. A fire in a timbered area, followed by heavy rain, is one ofthe causes of widespread land erosion. To derive the greatest benefit from timber for soil fertility andbetter farm working and living conditions, trees must be left to serve the wholeof the property. Properly located trees cool a property for stock in summer and warmit in winter. They protect the land from winds and in their widest aspect may becapable of some overall improvement in climate. Keyline timber clearing is planned to derive the greatest benefitfrom trees for the whole of the farm. First, trees are left in strips or belts wide enough to keep somesemblance of forest conditions in the timber for its normal healthy growth. Steep country is not left in full timber, but partially cleared andtimber strips are left to serve as wind protection for the property. The Keyline is again the planning guide for clearing. The first timberstrip half to one chain wide is left just below the Keyline and forms a Keyline TimberStrip. In most areas the lower side of this timber strip is suitable fora farm road being drier generally than the land above the timber strip. Crop or pasturesuffers more from the effects of moisture lost to the trees on the lower side ofa timber strip. However, when a road follows along the lower side of the strip thelittle extra water run-off from the road causes both grass and crop to grow wellright up to the road. The timber strip or the road along the timber strip forms a permanentguide for Keyline cultivation. The "first" Keyline road and Keyline timber strip. The road and stripcontinue for another half mile beyond the point shown in picture. Pasture consistsof cocksfoot, lucerne, rhodes and clovers. The area is above the "line of effectivewater pressure" and does not receive irrigation water. Pasture grows right upto the road. The trees protect the land. From the Keyline both up the slope and down the slope of the land,timber strips are left (or planted) on the contour at regular vertical intervalsapart. The important guide for determining this vertical interval between timberstrips is related to the height of the trees. If trees are 45 feet high the timberstrips could be 40 feet apart vertically. This provides some overall wind protectionfor all the land and locates the timber strips closer together in the steep countryand farther apart as the country flattens. Even in very flat country of low scrub or mallee only 10 to 15 feethigh this formula for clearing will provide greatly improved farm conditions. Theonly trees that are necessary other than those on this pattern are the ones leftaround the boundary of a Keyline paddock area. Timber strips left as described are a valuable aid to soil fertility,apart from the supply of the deep minerals which they bring to the surface. In wetweather cattle will only stay on soft pasture ground long enough to feed and thenreturn to the firmer ground in the undisturbed soil of the timber belt. The two most efficient land compacting implements are the sheep-footroller and the multiple pneumatic wheel roller. The farmer has to contend with hisown efficient compactors, which are his stock and wheeled farm implements. The comfortableconditions of the timber strips will keep his stock off wet, soft ground to a largeextent. The farmer, of course, should leave his wheel machinery in the machine shedwhen the land is wet. Thus compaction of the soil, one of the great destroyers ofsoil fertility, is minimised. By clearing the steep country on this pattern, more and better grassareas are available and better timber will grow in the timber strips. Very short steep slope country is always of greater value when clearedand Keyline developed. Suitable timber strips are left on the flatter top countryabove. Keyline Absorption-fertility methods above the timber strips do, bythe greatly increased moisture-holding capacity of this land, provide the timberwith better moisture. Timber growth is considerably accelerated. Timber strips will prevent land slips on country that would tend normallyto slip when fully cleared and saturated in heavy rains. The timber strip is a definiteand effective anchor, holding the land together. Land that has been Keyline cleared, when subsequently subdivided intopaddocks will have some shelter timber in all paddocks. Every paddock, whether inthe steeper slopes or the flat country, can be rotated to grasses and crops in turn. The only way to ensure perpetual timber is by providing conditionsthat allow trees of all ages to grow together. If each paddock in turn is closed to stock and cropped for two yearsor more in each ten or twelve years, young trees develop in the timber strips andpermanency of timber belts is secured. Decide on the location of the largest paddock areas--see further commentin the chapter headed "The Plan"--and locate the Keyline or Common Keylineof this section. Then peg or suitably mark a strip or belt from 30 feet to 60 feetwide parallel to the Keyline below it. This belt is to remain in timber. Next mark out the first timber strip above the Keyline by peggingor marking a contour line at a vertical height above the Keyline approximately tenper cent. less than the height of the Keyline trees. Mark another contour line abovethis one 30 to 60 feet wide. This pegged area is the timber strip which is to beleft there. Continue this contour marking, both above and below the Keyline. The contour marking of the tree strips leaves the strips themselvesof uneven width. If tree strips of even width are desirable, then a contour line formsthe lower line of the strips above the Keyline. A line, parallel to this, forms theupper line. Below the Keyline the upper line of the strip is on a contour and thelower line is parallel to it. A strip of trees may also be left around the boundary of the area. When the country is cleared on this pattern, the timber strips formpermanent markers for all Keyline cultivation. No land could be more spectacularly beautiful than the timbered undulatingcountry of Australia which has been cleared and developed by Keyline planning. However, large areas of land that will come up for Keyline developmenthave had too much of their timber removed without plan, and the growing of timberstrips will be a necessary part of the best Keyline development. Generally a small Australian native tree will cost a little over oneshilling to plant, but may cost over one pound to maintain for a year. While thecost of planting is not so serious and can be reduced by growing the young treeson the farm, the cost of growing timber strips of thousands of trees is impracticableunless some cheaper and easier methods are devised. Keyline planning and development will permit the closing of paddocksfrom stock for two or three years while crops are grown. This time will allow a plantedor "induced" timber belt to develop to a stage where the trees will survivewithout attention. In large or small paddocks without trees that are to be Keyline conversion-cultivateda timber strip 4 to 10 tree rows wide can be planned. After the paddock has beencompletely cultivated tree rows are marked; the first row by a deep single rip cultivationparallel to the Keyline or Guideline. The distances apart of the further rows oftrees are gauged by the tractor that will later cultivate between these rows. Thefollowing procedure has been found suitable. After completing the full Keyline conversion cultivation of the paddock,mark out by a single rip the first tree row position. A single shank is allowed topenetrate deeply through the plowed soil. On the return run with the tractor, placethe higher side rear wheel in the lower wheel track of the first run and travel thetractor back without ripping. Turn and again with the uphill side rear wheel in thelower track of the last run, mark out, by ripping deeply, the second tree row. Repeatto the number of tree rows to be planted. This row spacing will allow the tractorlater to cultivate satisfactorily between the tree rows. One or two cultivationsare advisable during the first year. This work is done some months prior to the time for planting the youngtrees, so as to collect as much deep moisture into the earth as possible. The objectis to improve the soil and to provide sufficient moisture in the soil before theplanting of the young trees, so as to avoid entirely the necessity for watering later. Australian native trees should be planted when a few inches high anda few months old, and planted directly from the tubes as used by the Forestry Nurseries.Plant the young trees well into the moisture zone without breaking the tubed soilin which the tree was raised. Press the soil down very firmly around the trees. Trees can be planted very quickly into this deep moist soil with veryfew losses and without the addition of any water. The distance apart of the treesin the row may be closer than is intended for the developed trees. Spacings of eightfeet are suitable for a variety of tree species. Planting time varies in differentdistricts. If watering and hand cultivation can be avoided, the chief cost ofgrowing the trees is also avoided. A tree strip on a Keyline may sometimes be satisfactorily grown byplanting the tree seeds directly into the paddock. 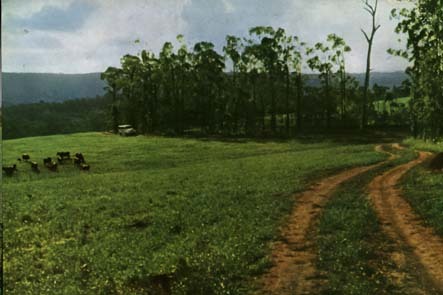 Trees can be induced to grow by a variety of means without the actualplanting of young trees or tree seeds, by merely leaving a strip of country out ofplowing when the paddock is closed for cropping. Tree growth will often flourishon the untouched strip and form a valuable tree strip. 1 . During the construction some years ago of several water races,	the completed drains, all except one, were harrowed and fertilised. A directive was	given that this one drain was not to be treated or touched in any way, in order to	see just what would grow on it. A variety of rubbish grew quickly on this exposed	subsoil. Three years later a row of trees 20 feet high, all of one species, covered	the drain. 2. During a very dry period several runs with a heavy road plow were	made to form a fire break. Later the dry grass of this fire break strip was burned	off. The paddock was not stocked heavily during the following two or three years. At the end of this time the fire break strip alone was then well overgrown with trees	all of one species. The trees here were a different species entirely from those which	were growing in the drain less than a mile away. From these happenings it can be seen that whenever a treeless paddockis to be closed up for cropping for two years or more, a suitably marked and plannedstrip of land should be left untouched, or perhaps given some special attention soas to allow a timber strip to develop of its own accord. Once the trees are two orthree years old the majority will survive stock damage.